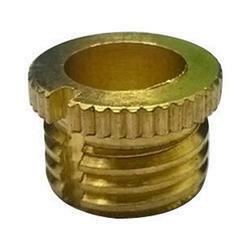 We have gained a huge appreciation in the market by offering an excellent array of Brass Threaded Round Nut. Established in the year 1989, we “Kavita Brass Industries” are a prominent firm that is engaged in manufacturing a wide range of Brass Electrical Accessories, Brass Inserts for Plastic, Precision Turned Components, Brass PPR Inserts for CPVC & UPVC Fittings, Brass LPG & CNG Fittings, Brass CNC High Precision Turned Components, Brass Pneumatic Components & Specialist of Brass Electrical Wiring Accessories like Brass Terminal block, Brass Earth Block, Brass Neutral Link, Brass Current Terminals, Brass Potential Terminals, Brass Threaded Inserts for Plastics, Brass Knurled Insert, Brass Nut, Brass Stud, Brass Screw, etc. Located in Jamnagar (Gujarat, India), we are Partnership firm and manufacture the offered products as per the set industry norms. Our valued clients can avail these products from us at reasonable rates. Under the headship of “Mr. Sandeep Thadoda” (Partner), we have gained a remarkable and strong position in the market.